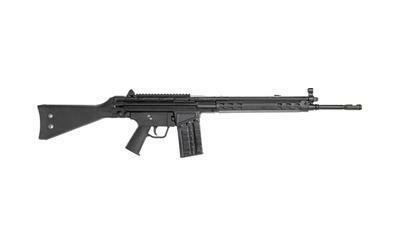 Cent Arms C308 308 Blk 18"
These are a New model offered by Century for 2015 and are built from Original Surplus CETME parts kits coupled with a new US receiver and 18 inch barrel with 5/8th x 24 threads & compensator . The C308 also features a Optic Rail on top of the receiver allowing the easy mounting of your favorite optic . The gun has a CETME Buffer & you will notice a little bit more recoil than the more modern PTR Type rifles . Black painted finish with black poly furniture provide a durable look & feel and finish off the rifle nicely . The C308 also will accept readily available G3 20 round mags and comes with 2 -20 round mags and 1 -5 round mag .If you are looking for a solid .308 Military style rifle on a budget this is a great choice . Rifle is covered under a 1 year warranty from the manufacturer .